Three ministries foreshadowed in the Old Covenant, and fulfilled in the messianic Jesus, are very much echoed in the Lord of the Rings: Priest, Prophet and King. This parallel, mentioned by Steven D. Greydanus in his article and Stratford Caldecott in his essay, involves the characters of Aragorn, Frodo and Gandalf [decentfilms.com - article here, Celebration p.29]. As already mentioned in Truth and Myth, they are not direct allegories. The similarities and parallels in the characteristics and happenings between these characters and Christ's life, death and resurrection are quite striking. Each goes through a type of death and resurrection experience. • Frodo is poisoned by Shelob, leaving Sam to think he is dead, but in fact survives and continues the Quest with his faithful servant. • Gandalf falls with the Balrog and is seemingly lost to all but returns healed and more powerful to 'complete the task'. • Aragorn passes through the Paths of the Dead under the mountains of Gondor, to raise the army of the dead [oath breakers] and turns up unlooked for at the Battle of Pelennor field to claim his Kingship. Indeed Eowyn and Eomer had given up hope of seeing Aragorn alive again. Each goes into the heart of the realm of the enemy to defeat him just as Jesus descended into Hell. • Frodo enters the dark lair of Shelob and the Black Land of Mordor and defeats Sauron. • Gandalf falls into the black abyss of shadow with the Balrog and defeats him. • Aragorn goes into the Paths of the Dead, and raises the army of the dead against the servants of Sauron. Legolas mentions to Pippin, "Strange and wonderful I thought it that the designs of Mordor should be overthrown by such wraiths of fear and darkness. With its own methods was it worsted." [LotR p.858]. This is reminiscent of Satan killing the Son of God, which is then used to redeem man. • Frodo takes the ship and passes into the West. • Gandalf takes the ship into the West. • Aragorn freely chooses the hour of his death. Frodo is the sacrificial lamb of Middle-earth; but he is also the one who makes a great sacrifice and offering of his life, thus taking up a priestly role as the intermediary for Middle-earth, in accomplishing the act of destroying the Ring and saving the world. Frodo is both victim and priest for middle-earth [cf. Hebrews]. He lays down his life for the many and becomes the mediator for all. Only in the Blessed Realm will he find rest, so he takes Arwen's place and goes with Bilbo, Gandalf and the Elves.
""' But, ' said Sam and tears started in his eyes, ' I thought you were going to enjoy the Shire for years and years after all you have done.'" Frodo, like Jesus, is overcome at the end. He 'dies' in a sense as he is physically overcome by the Evil of the Ring. Just a Jesus' body is destroyed and killed, but his spirit is faithful, so Tolkien mentions that Frodo's failure at the end was not a moral failure, but rather a physical one. Frodo, after months of carrying the Ring, is exhausted, starving and tortured by the Eye of Sauron. Tolkien, in one of his letters of 1963 [Letters p.326] says the no-one would have been able to resist the final weight and evil of the Ring, and that Frodo did not fail morally, but the quest was saved because of his earlier sacrifice of love in not killing Gollum and showing him mercy. Because of this, mercy was shown to Frodo and the Quest was achieved through a paradox of love and forgiveness. Frodo offers and his sacrifice is received. The sacrifice of love is the greater and more potent, so it bears greater fruit. Gandalf carried the Ring of Fire, Narya the Great [or Red] [LotR p.1004]. Gandalf's role was one of a Steward, not directly challenging Sauron, but going between all who opposed him, uniting and kindling their hearts to courage in the battle against evil. "I am a servant of the Secret fire, wielder of the flame of Anor". This is a peculiar comment by Gandalf, because nowhere in the appendices, indices or Tolkien's letters is there any explanation of this proclamation. But the full meaning is found when Tolkien once told an American friend that this 'secret fire', is the Breath/Spirit of Life [the Flame Imperishable] at the heart of the world [www.christianitytoday.com, article here]. "...apparently also called the 'Secret Fire', the Flame Imperishable seems to represent that aspect of Iluvatar through which he was able to grant free will and true life to the beings he created", which also confirms Tolkien's own words about it being the source of life, a kind of the Breath of Life. [Iluvatar is the One God]. Anor is the Sun, and so literally the 'flame of Anor' would be the light of the Sun, the fiery fruit of Laurelin, one of the Two Trees of Valinor. The Tree Laurelin gave Light to the Blessed Realm. Gandalf the Grey is characterized by his humanity and Gandalf the White is typified by his apparent divinity. • understanding the value of the hobbits. • seeing Gollum's part in the overall plan. • allowing providence to guide the outcome of Middle-earth, [e.g. Ents]. • seeing the future in Men for Middle-earth. • and seeing the course of action to take in the War of the Ring. Treebeard & the One Ring. Like real cultures and historical mythologies, Tolkien gave his characters many names. These names, given by different groups or persons to the characters, were usually prophetic and symbolized something of the purpose of the characters life. • Longshanks and there may be others. In reference to his Kingship, six of these standout: Aragorn, Estel, Envinyatar, Elessar, Strider and Thorongil. 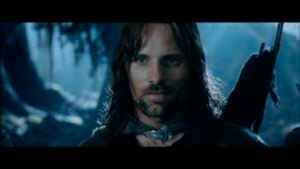 "In fact an early manuscript of Appendix A does give an account of the meaning of Aragorn's name. According to that account, after Arathorn had named his son, Aragorn's grandmother Ivorwen interpreted it as 'Kingly Valour'. Ultimately, Tolkien rejected this version of the story, but it is not known whether he also intended to reject 'Kingly Valour' as the meaning of Aragorn's name." • The name given to him at his birth is Elessar, which means "the Elfstone." [LotR p.366]. • The name given to him by Elrond [his foster-father] is Estel meaning Hope as in, 'he is the hope of his people.' [LotR Appendix A p.1032]. • And in the high tongue of Numenor, Envinyatar is "the Renewer." [LotR p.845]. • Strider is translated into Telcontar in the Elvish tongue [see further on regarding this name]. All these are naturally fulfilled in Aragorn as he takes up his heritage and becomes King of the Re-united Kingdom; but also they have similar meaning in reference to Jesus the True King. Aragorn is the true King of both Arnor and Gondor. When Elendil and his sons [Isildur and Anarion] set foot upon the shores of Middle-earth after the destruction of Numenor, they founded a Kingdom that had a northern and southern part. Isildur became King of both realms after the death of Elendil and Anarion in the Last Alliance of Elves of Men; and he entrusted the Southern Kingdom to his son. But it was still one Kingdom. Isildur was riding home north when he was killed in the Disaster of the Gladden Fields [where the Ring slipped from his finger into the Great River]. His son became King in the North. In the South, the Kingdom remained strong for many thousands of years but later fell into decay and the line of Kings failed. Stewards were set up to rule the Kingdom with the hope that one day the King would come again and the line of Kings would be restored. Denethor's comment fore-shadows Aragorn's appearance and restoration: "Unless the King come again" was part of an oath that a newly sworn in Steward would recite in Gondor, partly in hope and partly in tradition. In Christian tradition, the saying Maranatha means Come Lord Jesus' and is a prayer to hasten the Lord's coming. Jesus' Second Coming is not referred to as a returning or coming back because he has remained with us [he never left us]. He is in the tabernacle of each Catholic or Eastern Church. But he will come again. In fact, there is a shadow of this in Lord of the Rings as Aragorn has actually already been among the men of Gondor before his Official claim to Kingship, but under another name and guise. He fought and served under the name of Thorongil in both Gondor and Rohan when he was younger. He is much older than other men because of his Numenorean lineage. He is 80 in the Lord of the Rings but that is young for someone of his race. He is 240 when he dies. Hence he served as Thorongil under the fathers of Theoden, King of Rohan and Denethor, Steward of Gondor. As already mentioned Thorongil means Eagle of the Star. In the Book of Revelation in the Christian Bible, the eagle is represented as an angelic being flanking the throne of God and flying in the heavens like the cherubim and angels. The eagle is important in Jewish theology as well, as an emblem of God in the Book of Exodus. Other great cultures and kingdoms have used the eagle as a sign of strength and royalty; for example the Roman Empire, and of course the more infamous use of the Nazis in WWII. "Sing now, all ye people of the Tower of Anor, for the Realm of Sauron is ended forever, and the Dark Tower is thrown down. Sing and rejoice ye people of the Tower of Guard, for your watch hath not been in vain, and the Black Gate is broken, and your King hath passed through, and he is victorious. "Now God's home is with his people! He will live with them and they will be his people. God himself will be with them and he will be their God. He will wipe away all tears from their eyes. There will be no more death, no more grief or crying or pain. The old things have disappeared." "Lady Full of Grace: Rejoice, O Pure Virgin! Again I say: Rejoice! Your Son is risen from His three days in the tomb! With Himself He has raised all the dead! Rejoice, all you people! Shine! Shine! O New Jerusalem! The Glory of the Lord has shone on you! Exalt now and be glad, O Zion! Be radiant, O Pure Theotokos, in the Resurrection of your Son!" Added to this, is the imagery and words that describe the Field of Cormallen which is once again very much like the imagery found in Revelation concerning the King and the White Rider [Rev 19:11-12]. And the song sung in honour of Frodo and Sam, fulfils the exaltation of the humble [LotR p.932]. "Long live the Halflings! Praise them with great praise! Cuio i Pheriain anann! Aglar'ni Pheriannath! [May the Halfings live long! Glory to the Halfings!] Praise them with great praise, Frodo and Samwise! Daur a Berhael, Conin en Annun! Eglerio! [Frodo and Sam, princes of the West, glorify them!] Praise them! Eglerio! [Glorify them!] A laita te, laita te! Andave laituvalmet! [Bless them; bless them, long we will bless them!] Praise them! Cormacolindor, a laita tarienna! [The Ring Bearers, bless them to the heights!] Praise them! The ring-bearers, praise them with great praise!" [translated Letters p.308]. Not only is there interesting similarity in the sung versus but also in the words used for the taking up of the Kingship by Aragorn. This is very much like the Bride [the Church] being made ready for coming of Christ and the New Jerusalem, the New Creation to follow. Tolkien mentioned the "Eve of May" [and uses capitals to denote it, though he did use capitals for a lot of phrases, but why use capitals for this?]. In the catholic tradition May is the Month of Mary; this is because new life has come to us through Mary. Tolkien had an extremely strong love and devotion to Mary. Also interesting but probably coincidental, is the way Tolkien writes it, Eve of May; Mary is the Second Eve, through Mary came the Redeemer, New Life came to us in Jesus but through Mary. 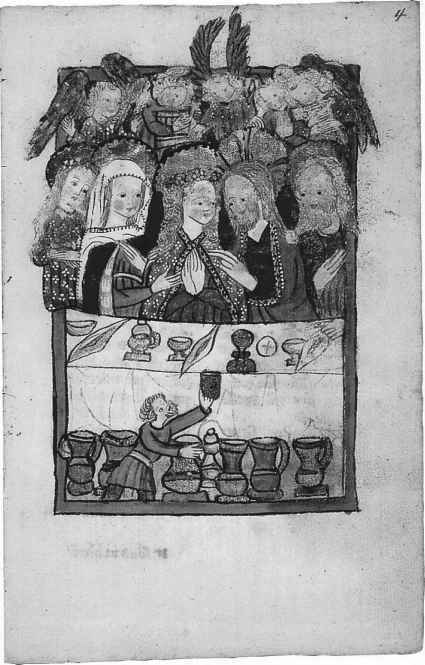 This is why May was chosen as Mary's month. Traditional understanding and study of scripture places the original creation in Spring & May in the Garden of Eden; and also Jesus' death and resurrection takes place in spring. And the New Creation and restoration of the Reunited Kingdom in Middle-earth occurs in May. In coming to save the Kingdom of Gondor, Aragorn passes through the Paths of the Dead and summons the Oathbreakers to the Stone of Erech, where they are called upon to fulfil their oaths and depart in peace. The oaths they had sworn were to fight in the earlier wars against Sauron, but they had fled preferring the darkness. Aragorn, much like Christ descending into Hades, passes through the Paths of the Dead, and calls those bound to him as the Heir of Elendil. The Gospels recount that when Christ had risen, many of the dead were seen around the streets of Jerusalem, themselves risen through the grace of Christ. Tied in with this, is the manner in which he comes to Minas Tirith. Eomer, Eowyn and the Rohirrim cannot understand why Aragorn would take the Road to the Dimholt, and in fact they try to counsel him to do otherwise. It seemed like folly to them. For the apostles who followed Christ, it also seemed like folly that Jesus would take the road of suffering and darkness, and enter into glory through a different road than they had imagined. He becomes the King of Israel through an unforeseen Path. Aragorn does much the same.